Shipping Weight: 30 lbs. 8 oz. 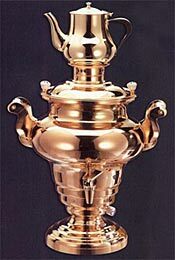 Royal BEEM Russian Samovar - 18/10 Stainless steel, 24 kt. gold plated. Bring to your tea room the style of Russia's old Imperial Court elevating tea service to a new level of sophistication. Capacity: 15 Liter (530 oz.) water reservoir and 2 Liter (70 oz.) teapot. Size: 28 1/2 inches tall by 16 inches in width. 110V, 1300 watt heating element. Other size and mirror finish stainless steel Samovars available upon request.